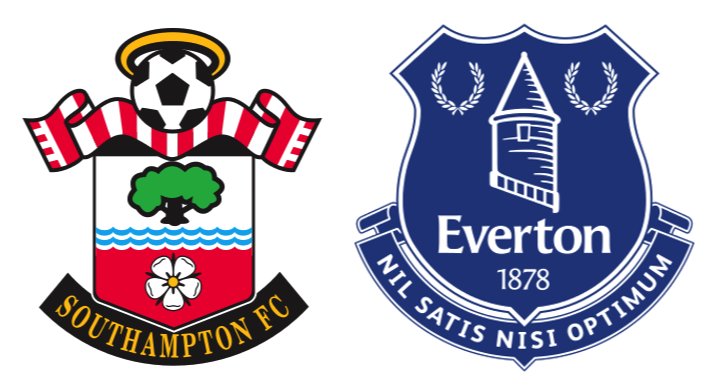 They say that the true mettle of a manager and his team can be found in adversity, and coming into this mid-winter game versus Everton, Southampton were certainly staring this old adversary squarely between the eyes. 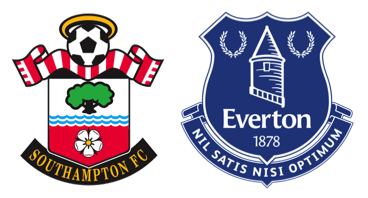 With a squad shorn of 10 regular starters, and along with them, the group’s collective confidence, Koeman and his team knew a strong reaction was required after 4 straight league defeats and an inept exit from the League Cup at the hands of League 1 Sheffield Utd. 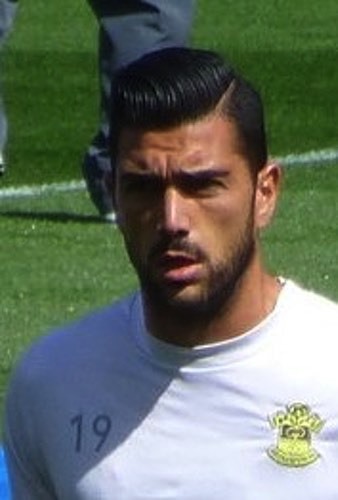 In his days as Feyenoord’s manager, Koeman would turn to playing 5 at the back in similar times of adversity, but even so it came as a surprise to Roberto Martinez and his Everton team when the Southampton manager sent out his team with Fonte, Alderweireld and Yoshida in the centre of defence. But this tactical change was more than just a hunch by Koeman; it was a formation specifically designed to stop Everton and then hit them where they are most vulnerable. It also suited the players at the manager’s disposal. Both wing-backs, Clyne and Bertrand, are strong in defence with a penchant for attacking, so they were able to not only stop their opposite numbers, Baines and Coleman, but also get behind them repeatedly. And it was one such move that was the creator of Southampton’s first chance. Having conceded much of the possession to Everton in the first quarter of an hour, Clyne got behind his England counterpart Baines to hang up a perfect cross which found Pelle unmarked, but the Italian could not find the target. A chance missed, but this was promising. Not only had Clyne ripped open the opposition, but Pelle had found space in the penalty area with relative ease. Harrison Reed played a deep defensive role with ample protection behind him in the form of Fonte, Alderweireld and Yoshida, and it was Reed’s stifling of Eto’o and Barkley which provided the key to enabling such a strong performance from Southampton. Everton’s stars were not given a moment to settle on the ball as the 19 year old debutant repeatedly snapped at their heels, stealing ball after ball. It was a thoroughly impressive first start for the Saints man who recently signed a 5 year contract with the club. After stealing possession yet again from the former Barcelona and Real Madrid star Eto’o, Harrison Reed eschewed an ambitious pass which would have set Shane Long away, instead choosing to play a simpler sideways pass for Nathaniel Clyne. Here was a 19 year old carrying out his manager’s instructions to the letter, but all the time indicating that he has so many more skills in his armoury. And it was another through-ball to Shane Long which led to Southampton’s first goal. The ball dropped in Everton’s penalty area so Jagielka swung a leg at it to clear. But Shane Long, the constant pest, got there first and the Everton defender only succeeded in raking his boot through the player. But the referee, who saw things rather differently all afternoon, ruled that Jagielka had got the ball and not the man, and so gave a corner instead of a penalty. As it turned out, this decision made little difference, for James Ward-Prowse swung across a dangerous corner that was nodded in by Lukaku under pressure from Jose Fonte. Southampton were 1-0 up with only 10 minutes until the break and the team’s confidence levels were replenished just a little. Because Everton had controlled the ball for much of the first half, Koeman tinkered with his system at half time and James Ward-Prowse played a more central role alongside Reed. It worked. Further chances were created and missed by Southampton, who now looked the most likely team to score and extend their lead. This is exactly what happened when Leighton Baines once again allowed Clyne to cross. Shane Long rose unchallenged to nod the ball back into the danger area. Graziano Pelle needs no encouragement in such positions, so he beat both the defender and keeper to the loose ball, which nestled in the net and everyone in red and white was able to unclench for the first time in a few weeks. Any team with Toby Alderweireld, who commanded the back three from his central position imperiously, does not give away a 2 goal lead. 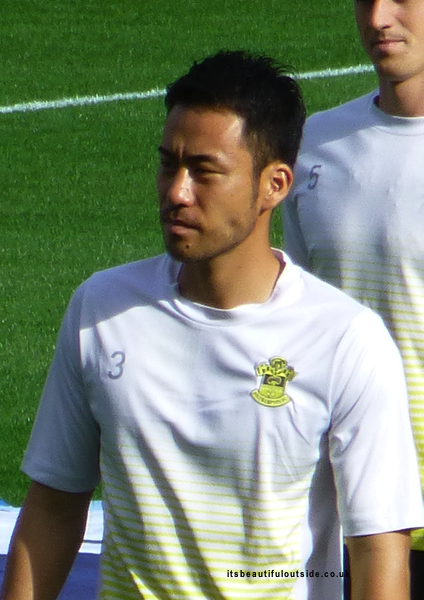 Although it was Alderweireld who was the most impressive of the 3 central defenders, it was another, Maya Yoshida, who finally secured the victory. He is a player on the margins at St. Mary’s, perhaps labelled as ‘not quite good enough’, yet he uncomplainingly gets on with his job whenever asked to do so. With the added protection of 5 in defence, Yoshida appeared taylor-made for Koeman’s new formation, and he capped off a fine performance with a goal. Picking up a loose ball in the penalty area, the centre back had the presence to find Steven Davis, who picked out a delightful cross which Yoshida rammed into the net by hook or by crook. Yoshida celebrated with great glee, and for the first time his name was sung out by the Northam End. It was a nice touch for an unsung player who gives fine service to the club. Saints could point to plenty of bad luck in recent defeats to United, Arsenal and Burnley, but they had no such excuse in the poorest performance of the season against Sheffield Utd. And so, regardless of injuries and suspensions, a response was needed by both manager and players. Against a strong Everton team they gave exactly this. In many ways it was one of the most impressive performances since Saints’ return to the Premier League. The true mettle of this squad was obvious, and they must now use it as a turning point as the harsh winter continues for a few weeks yet. With 5 matches in 3 weeks, including fixtures against Chelsea, Arsenal and Man Utd, Koeman’s job is now to harness this spirit. If he can do so, the reward of a Champions League spot will remain within Southampton’s grasp.